Try this easy Easter crafts idea making special dog holiday treats to celebrate Easter with all your loved ones - four legged too! Get the kids involved as well. Dog crafts are fun and becoming less of a novelty. Be the first to bring homemade dog treats to the celebration. There is always a lot of thought and planning that goes into feeding the humans, but the poor pet dog gets left out! People will marvel at your creativity. Many of them will be surprised that there are actually dog treat recipes and things such as dog cakes! 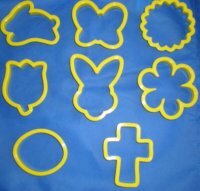 Use the cookie cutters pictured above to make dog cookies - use a dog biscuit mix to cut out the shapes. Or, simply bake up some mini dog biscuits in a paw print or bone shape and decorate with brightly colored dog treat icing. For spring, yellow, green, orange, white, pink and some purple and blue are happy, bright colors. Just mix the color into the dog treat icing and drizzle it over your baked dog cookie or dog biscuit. Just make sure you let the dog icing dry completely before stacking the treats. Here's a novel dog gift idea that is an easy craft for kids to do: buy inexpensive plastic Easter eggs and place homemade dog treats inside. Pack the Easter eggs in Easter grass in a basket. Now you have your own Easter gift basket for the dog! You cannot give the dog the plastic eggs to open because he could choke on the plastic. So you will have to open them for him while he sits or lies down in anticipation for his treat. His nose will surely let him know that something of interest is inside those plastic Easter eggs.